Stock-Trak® has been the leading provider of educational virtual trading applications since 1990. Reaching nearly 750,000 high school, middle school, and adult learners each year. Stock-Trak has been the leading provider of educational stock market portfolio simulations and personal finance applications since 1990. Disappointed with lack of any real-world trading experience in his graduate-level Investments classes, Stock-Trak’s Founder and CEO, Mark T. Brookshire, wrote the first virtual trading application designed exclusively for college Investments classes shortly after graduating from Georgia Tech with a Master’s of Science in Management. From the original concept of providing university students with the opportunity to simulate managing a portfolio of stocks, bonds and mutual funds, Stock-Trak’s family of financial education sites has grown to include nearly a dozen proprietary sites each serving a different audience. Stock-Trak also white labels its virtual trading application to banks, brokerages and other financial services companies. HOWTHEMARKETWORKS.COM – TARGETS HIGH SCHOOL & COLLEGE STUDENTS IN PERSONAL FINANCE, BUSINESS AND FINANCE CLASSES; AS WELL AS ADULTS WANTING TO LEARN ABOUT INVESTING IN THE STOCK MARKET. HowtheMarketWorks is now used by 400,000 users each year and features trading of U.S. stocks, bonds and mutual funds. 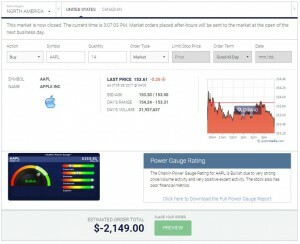 This site also allows any user to create a customized stock market game and challenge their classmates or friends. The site also features over 300 educational articles, videos and assignments aligned to national high school standards. WALLSTREETSURVIVOR.COM — TARGETS THE GENERAL PUBLIC THAT WANTS TO LEARN HOW TO INVEST IN THE STOCK MARKET; INCLUDES FREE COURSES. Wall Street Survivor&reg is used by 150,000 individuals each year looking to learn about the stock market and practice trading U.S. stocks and options with a free virtual portfolio. This site also features many short and concise courses to provide more information. VIRTUAL-STOCK-EXCHANGE.COM — TARGETS INTERNATIONAL HIGH SCHOOL STUDENTS IN PERSONAL FINANCE AND INVESTING CLASSES; AS WELL AS INVESTMENT CLUBS WITH A GLOBAL PERSPECTIVE. Virtual-Stock-Exchange has over 15,000 global users each year, primarily based in North America and Europe. This site allows users to trade in English, Spanish, French, Mandarin, Hungarian, or several other languages, based on their preference. PERSONAL FINANCE LAB – TARGETS HIGH SCHOOL BUSINESS AND PERSONAL FINANCE PROGRAMS. PersonalFinanceLab is a unified platform combining our cutting-edge stock market game with embedded curriculum used in personal finance, economics, and business classes. INVESTING101.NET – TARGETS INDIVIDUALS LOOKING FOR AN ONLINE INTRODUCTORY STOCK MARKET COURSE. Investing 101 is an online Investments course that is structured like a college level class with chapters, additional reading, exercises and quizzes to that users can monitor their own progress and move at their own pace.